" My experience was excellent. The staff is delightful, professional, knowledgeable & helped me from start to finish. My eye exam was done by Dr. Williams - I was very impressed & plan on recommending her & Rosin to my friends. Erica got me all set up. Cat helped me choose my glasses & order contacts, both of whom are great! Michelle & Wilmarie are wonderful!! Basically, I get quality care, attention & service at Rosin - Thank you. " " The exam was thorough and efficient. The doctor provided understandable information and answered all my questions. Frame selection is good. The fitting was good. I am satisfied with the glasses and my vision while wearing them. Overall, a very good experience. " " Getting eyeglasses here was a breeze. I walked in, chose the frames I liked, provided prescription, and they were available in a week. They accepted my insurance, were very friendly, and have great office hours. I would recommend Rosin to anybody! " " I was able to book an appointment next day. The eye doctor was very nice and the appointment was easy and quick. The woman who helped me find glasses was very patient and kind. Everyone was very nice and made for an easy appointment and choosing glasses. " " I am very happy with the care I've received from Rosin Eyecare. From the thoroughness of my exams to the prompt responses, I have no complaints and feel very comfortable recommending them to family and friends "
" I was happy to be able to get an appointment the next day, everyone in the office was friendly and polite, the Doctor listened to me and make sure I understood what was wrong with my eye, and the procedure I needed to care it. He was very professional, yet friendly. My visit was flawless. " " I highly recommend Rosin. They are always so nice and the doctors know just what to do when it comes to our eye needs. " " Fast, friendly service. If your looking for personalized service in a professional but extremely friendly atmosphere choose Rosin Eyecare! " " Very friendly and courteous staff. The two doctors I have worked with are professional. They answer all of my questions and clearly explain the issues they observe. Rosin has a nice selection of frames and satisfactory turn around time. I highly recommend. " 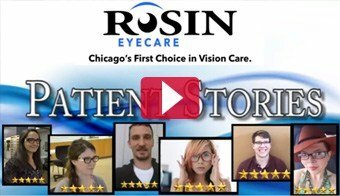 Rosin Eyecare has been an eye doctor in Chicago for more than 80 years. As it was with our very first eye center, our dedicated Chicago eye doctors and staff are committed to keeping your eyes healthy and giving you the best possible vision. We offer comprehensive eye exams, glasses, and contacts, along with a variety of eye health checkups. Dr. Rosin and his talented team of ophthalmologists, optometrists and technicians in the Chicago area work with you to ensure excellent eye health throughout your life. We keep up with regular follow up appointments, answer any questions you have, and have a wealth of information at the ready. Our website can help you research the perfect eye care procedures for you. If you still have questions, we offer risk-free, no cost consultations with no pressure to buy! Generations of Chicagoans have relied on us for their eye care. But, we don’t take any of this for granted and strive to serve every patient on a one-on-one basis with a uniquely tailored vision plan. From our beginnings during the heart of the Great Depression to today’s advanced laser vision correction technology, Chicago Rosin Eyecare is always looking out for your eyes.